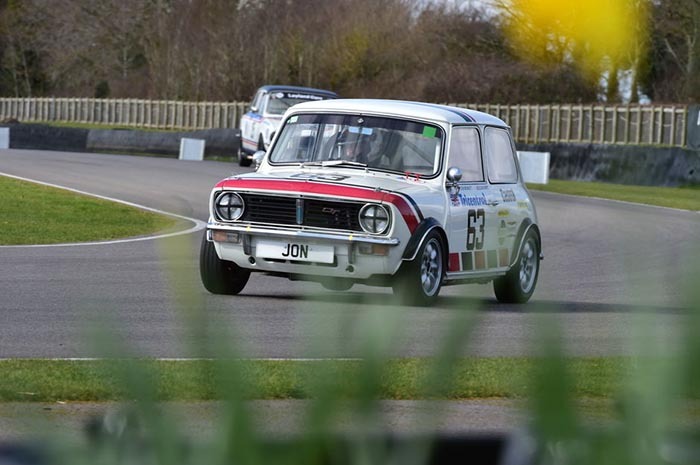 Yesterday the Longman 1275 GT Replica returned to Goodwood for a second test at the circuit and was joined by the original Jon Mowatt 1275 GT which has just been restored by Glyn Swift. Unfortunately due to BTCC commitments Jason Plato was unable to test, but Andrew Jordan returned for his second test in the Longman 1275 GT in which he will be partnering Nick Swift at the Members Meeting. The day had a very cold and damp start and continued to show a varied range of weather from bright sunshine to a short sleet shower, making the day very stop start for the Swiftune Mini’s. Although the day was a general test day for Goodwood, the track predominately featured cars testing for the 73rd Members Meeting as they continue to prepare for the iconic meeting in two weeks time.